Ken Lehmann was born January 13, 1942 in Louisville, Kentucky. He had a stand out college career at Xavier University in Cincinnati, Ohio where he was named Most Valuable Lineman in his junior and senior year. 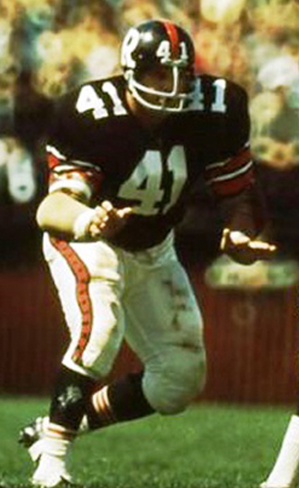 In 1964, Lehmann was recruited to join the Ottawa Rough Riders. He soon became a fan favourite as a result of his hard-nosed play at middle linebacker. He was chosen as an Eastern All-Star five times through out his career and All-Canadian four times. In 1966, Lehmann was the Eastern finalist for the Schenley’s Most Outstanding Linemen Award and subsequently won the award in 1968. A mainstay of the Ottawa defense, Lehmann participated in a total of three Grey Cup games with the Rough Riders, and won two. He played the entire 1968 Grey Cup with a dislocated elbow. At the time of his retirement, Lehmann held the record for most blocked kicks during a regular season game with two. Ken Lehmann is also a member of the Ottawa Sports Hall of Fame.